American Blinds and Shutters Outlet offers a nearly endless array of window coverings. 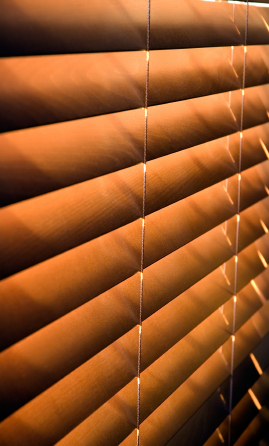 Window shades help modify the lighting levels and ensure some extra privacy. Woven wooden shades are a unique element that can add visual interest to many styles of interiors. Vertical blinds are another versatile option, available in fabric, vinyl, paper, and canvas materials. Classic wood blinds lend your home a touch of traditional elegance, a look that can also be replicated with easy-to-maintain faux wood blinds. Looking for new curtains? American Blinds and Shutters Outlet will work with you to select the perfect fabric and create custom draperies and curtains that fit your unique interior style. American Blinds and Shutters Outlet offers a wide array of attractive, durable shutter styles. They also offer Polycore Shutters, a versatile exterior window covering option. Polycore shutters are durable, reliable, and easy to maintain. They won’t absorb and become damaged by moisture, unlike wooden shutters, and they never need to be repainted. You never know when the next major storm will come your way. Don’t go without hurricane protection: call American Blinds and Shutters Outlet to outfit your home with durable storm shutters that will keep out the wind, rain, and debris in the next tropical storm. Whether you’re looking for blinds, shades, or curtains for privacy and decoration, or for storm shutters strong enough to protect your home from Nature’s wrath, American Blinds and Shutters Outlet is Mount Dora’s premier shutter company. In search of a Mount Dora shutter company? Then please call 407-492-1009 or complete our online request form to schedule a consultation.